A landmark achievement for the MEA region. 6 March 2019 saw the launched of the first Microsoft datacenters in Africa. which opened in both Cape Town and Johannesburg. This world-class cloud infrastructure will power emerging cloud, AI and edge computing innovations across the African continent. Microsoft is the first global provider to deliver cloud services from datacenters in Africa, and has announced 54 Azure regions worldwide, more than any other cloud provider. According to the Cloud Africa 2018 report, use of the cloud among medium and large organisations has more than doubled from less than 50 percent in 2013 to pervasive use in 2018. While Kenyan and Nigerian businesses see business efficiency and scalability as the most significant benefits of cloud computing, South African companies view time-to-market and speed of deployment as the greatest advantage. The security and reliability of cloud services are pivotal when discussing digital transformation. At the same time, cloud services help with compliance for evolving laws around data protection, which have become increasingly focused on data residency requirements. Today the Abu Dhabi Smart Solutions and Services Authority (ADSSSA) today announced that it has signed a memorandum of understanding (MoU) with Microsoft to establish a ‘Cloud centre of Excellence’ that will aim to build its capacity for the delivery of cloud services and platforms, as well as upskill the emirate’s public sector workforce. Microsoft’s collaboration with ADSSSA will focus on the establishment of a Cloud Centre of Excellence. Under the agreement, Microsoft will provide instructor-led training for 240 government employees from various departments and agencies. The training will be distributed across 11 tracks, and will encompass all Microsoft skill levels, from 0 to 300. Instruction will ensure that Government of Abu Dhabi employees are well-versed in such technologies as Microsoft’s Azure cloud platform, Office 365, data, AI and Dynamics 365. Through Cloud Society in Box, Abu Dhabi Government employees will receive access to an online training portal hosted on ADSSSA Azure Tenant that can be customised to assign and track training paths. Microsoft specialists will be on hand to deliver regular support to all training delegates and guide them on their upskilling journeys. Yesterday Smart Dubai today announced a landmark collaboration with Microsoft to achieve the goal of making Dubai the happiest city on Earth. The move aims to accelerate digital transformation across the emirate and empower government employees to innovate faster. Under the terms of a memorandum of understanding (MoU) signed by H.E. Dr. Aisha Bint Butti Bin Bishr, Director-General, Smart Dubai, and Sayed Hashish, General Manager, Microsoft Gulf, Microsoft will support Smart Dubai in its digital transformation journey by accelerating adoption of Microsoft Cloud technologies, and will conduct targeted training sessions as well as upskilling workshops in cloud and other associated technologies. Smart Dubai was formed under the guidance and vision of His Highness Sheikh Mohammad bin Rashid Al Maktoum, Vice President and Prime Minister of the UAE and Ruler of Dubai, to make Dubai a knowledge hub and the happiest city on Earth. The organisation’s strategy is to urge participation and counsel from a wide array of city stakeholders, including residents, visitors and business owners. Under the MoU, Microsoft’s UAE datacenters that are expected to open this year, will be used to support the Government of Dubai’s digital transformation efforts through the adoption of a range of Microsoft technologies. Microsoft will train departmental staff in those technologies, empowering them to achieve more in their roles, and accelerate digital transformation across the emirate of Dubai. Microsoft experts will also collaborate with Smart Dubai on use cases and adoption scenarios, and will work jointly on roadmaps for rolling out new platforms to other government entities. Microsoft will also conduct awareness sessions on its cloud technologies for government entities and guide those entities on how best to benefit from online Microsoft courses and certifications. Last week HE Omar Sultan Al Olama, Minister of State for Artificial Intelligence confirmed that the UAE government adopts an integrated and dynamic model for the utilization of artificial intelligence that supports industry growth, development of new sectors as well as strengthening governance and ethics frameworks, ultimately anticipating future challenges and creating a positive change for humanity. The focus of this collaboration will be on four key areas: identifying and developing technological solutions based on artificial intelligence to achieve the United Nations goals of sustainable development, enhancing the use of artificial intelligence in all government bodies in the UAE, establishing an integrated and global framework for governance and AI ethics, contributing to achieving the outputs of the UAE Strategy for Artificial Intelligence. In November 2018, Dynamics 365 AI for Sales (Now called “Sales Insights”) was made available in North America. We are happy to announce that Dynamics 365 Sales Insights has expanded availability to also include Europe, Middle East and Africa. Customers can join the product preview, start a trial as well as purchase licenses to empower users across the sales organizations with Dynamics 365 Sales Insights. Dynamics 365 for Customer Service is a “next-generation” application of big data and machine learning. Before November 2018, we used the term “international availability” to capture multiple intentions: the physical location of the data, where the data is stored (“Region”), and the language in which information is displayed (“Display language”). Following the release of the new Dynamics 365 Sales Insights, there is a new intent: the Model language, specifically the language of the data that is parsed by the model to produce insights. With Dynamics 365 for Sales, System Administrators can specify the region where customer data will be stored. In the process of creating a new org, customers can select a geographic location (“Geo”) to determine where data will be stored. Data will not move from one geo to another, and Microsoft will not limit the geos/locations where customers, or their end users, can access data. Dynamics 365 Sales Insights is now available across multiple geos, including North America, Europe and the UK. We expect availability to additional: Australia, Asia Pacific, South America, Canada, India and Japan, also by end of April 2019. When creating a new org, System Administrators need to select a base language for the org. The base language determines default regional and language settings for the org. Once base language is selected, System Administrators can enable additional languages for display as well as for assistance (“Help”). Dynamics 365 for Sales currently supports 45 display languages. Currently, Dynamics 365 Sales Insights for Sellers supports all 45 display languages. With the new Dynamics 365 Sales Insights, some features use natural language algorithms to derive insights. Those capabilities analyze text (such as email communications or notes) as well as voice utterances (from call recordings), to develop relevant and actionable insights. From the full list of Dynamics 365 Sales Insights capabilities, two features are still limited to North America. These include Who Knows Whom and Relationship Analytics from Exchange. 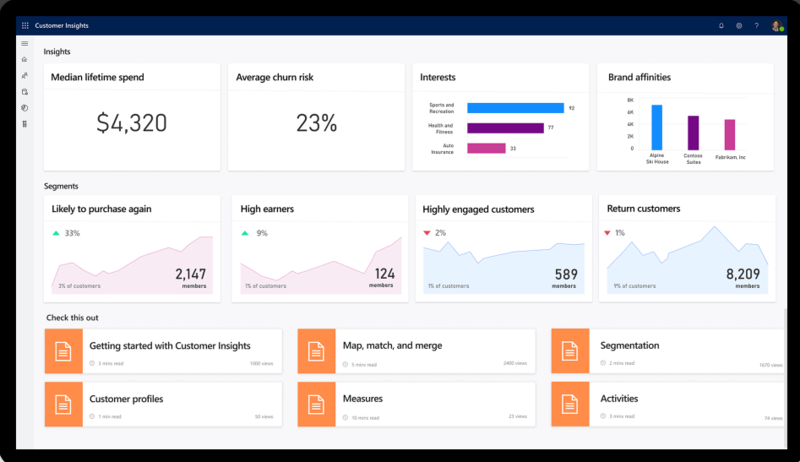 However, Customers in Europe, Middle East and Africa can still benefit from Relationship Analytics, to analyze the health of their customer relationships, based on activities within Dynamics 365 only. In an event that there are intermittent Azure AD outages, authenticated users can continue to access the Dynamics 365 for Customer Engagement/Common Data Service data if the PCI claims have not expired or the user has opted in the ‘Stay signed in’ during authentication. Dynamics 365 ‘One Version; April 2019 release – what’s new?. Dynamics 365 for Finance and Operations unifies global financials and operations to empower people to make fast, informed decisions. Finance and Operations helps businesses adapt quickly to changing market demands to drive rapid business growth. The April ’19 release will bring users together on One Version (version 10) for Dynamics 365 for Finance and Operations. This release marks a monumental shift in supportability based on a common codebase and continuous update cadence. that’s till allows for customers to build extensible solutions for Dynamics 365 for Finance and Operations. This release also enhances the user experience of the solution with Net Promoter Score (NPS) feedback as a primary driver. The targeted areas of t enhancements include: performance, compliance, automation, and supportability of the service. The April ‘19 release for financial management provides capabilities needed to comply with IFRS 15 and for responding to the guidance on accounting for revenue recognition on contracts. An enhanced expense report entry experience with a new header and details expense report, together with an automated settlements processin the general ledger completed periodically. Bank foreign currency revaluation I also added.. Inventory management performance improvements. The April ’19 release, introduces the ability to configure and apply unit of measure (UoM) conversions for product variants so that UoM conversions at the product variant level are supported throughout the application. In future releases, new classes of products and production processes will evolve the product definition . The inventory valuation capabilities will be expanded to support scenarios where multiple valuation methods and multiple currencies are required—for example, in case of different managerial reporting and statutory reporting requirements. Inventory on-hand information will be more readily available in distributed scenarios, such as the retail industry. The Warehouse Management System (WMS) has been gradually enhanced since its introduction in Microsoft Dynamics AX 2012, and a large suite of additional enhancements has recently been licensed from an ISV. With the April ’19 release, the integration of these enhancements will begin, and the ability to handle catch weight (CW) products in WMS processes will be added. The suite of 30-plus distinct features will partially be integrated as preview for the April release and its subsequent monthly releases. For example, a feature like enabling label printing during wave adds flexibility in configuration and operation. Usability enhancements in sales and procurement will allow Super users will be able to propose filtered views and build forms where unnecessary fields or actions can be removed. Super users knowledge can thus be more easily disseminated to the organization and all skill levels of users can benefit from targeted views, crafted for the task at hand. Going forward expect to see: supplier collaboration, extended self-service, data sharing and maintenance capabilities, and improved business support within integration scenarios such as : purchase requisition, request for quotation and purchase ordering relative to data flow and accounting distribution constraints. A primary focus will be improvements to track and account for goods in transit. There will also be enhanced support to kit to stock, as well as kit to order, and to enhance sales price and promotion management with extended price management flexibility. In the April ’19 release, the focus is on optimizing the resilience of master planning toward platform and infrastructure errors, as well as to deliver incremental master planning performance improvements. To support the connected, intelligent operations of modern manufacturer integration with the intelligent Microsoft Azure IoT service will support manufacturing customers close the digital feedback loop with close to real-time information from the shop floor with business data to generate events and actionable insights. The future road map includes enterprise asset management capabilities to track the total cost of ownership of operations assets, nd to manage the ongoing maintenance of those assets. .
Microsoft Dynamics for Finance and Operations is localized for 37 countries/regions and provided in 42 languages directly. To operate in many countries or regions, businesses need to quickly respond to changing regulatory requirements and meet very specific requirements of industries and verticals. The April ’19 release, will expand the areas of configurable localization to simplify this process. Configurable engines for both Electronic Reporting and Global Tax, are accessible through Regulatory Configuration Service, so that users can extend Microsoft-delivered regulatory configurations or build new configurable features from scratch. The invoice layout is one of the most-customized areas by customers who deploy globally, in the April ’19 release there are more configurable invoice layouts beyond the Free Text Invoice layout that shipped in the October ’18 release. Several improvements to the developer tools will be previewed in the next 3 months. -Development of more than one application on the same environment will be possible. - Build automation will not require build virtual machines and will enable automated deployment to Lifecycle Services (LCS). The Web Client introduces new features guided by user productivity, usability research, and customer feedback. This includes personalization of forms and workspaces, interacting with large data sets (with better filtering), and mobile device responsive capabilities. An improved workflow experience, including integration with Microsoft Flow, will be available. Analytical Workspaces support new personalization options and power user editing tools of Power BI reports within the Finance and Operations client. Power users can extend reports and do data mashups using PowerBI.com functionality without any developer intervention. New tools for management of network printers are also introduced. The Entity Store is supported for on-premises deployments. Customers will be able to seamlessly link to Common Data Service (CDS) for Apps from Dynamics 365 for Finance and Operations. A breadth of Finance and Operations entities will be available in CDS for Apps. Entity Store will be staged in a customer’s Azure Data Lake. Microsoft will keep the data fresh with incremental syncs. Event-driven integrations is a new capability that provides a framework to allow Finance and Operations business and workflow events to be consumed by Microsoft Flow and external systems. For example, this will enable a PO confirmation to trigger fulfillment by the vendor earlier; or enable a receipt of a damaged part to trigger the vendor claim process in real time. Microsoft will manage the continuous updates of Platform, Application (Finance and Operations, Retail), and Financial Reporting . A set of tools and experiences to support this experience (called One Version) will be made available in Lifecycle Services and will enable predictability, reliability, and continuous delivery. The service will also be made available in the China Sovereign Cloud with all customer data maintained within the region. Diagnostic assistant enables an IT administrator to diagnose user-reported issues or performance issues using a guided troubleshooting experience in Lifecycle Services (LCS). The administrator selects from a list of predefined issues and provides a set of inputs to narrow down the search results. The inputs could vary based on the issue selected. They will then be guided on a drill-through experience that correlates multiple sources of information to help the administrator identify the root cause quickly and efficiently. Today, a lot of this information is available in LCS, but you need an expert to correlate the different pieces. To troubleshoot the issues that arise from customization, activity monitoring, SQL insights, critical health metrics, and live view are made available to the IT administrator. The goal of this feature is to help simplify this experience. Once a potential root cause is identified, the administrator can choose from a set of predefined actions that they can take to mitigate the originally reported issue. The true value of a cloud service is realized through continuous updates that can provide both improved reliability and new features, while minimizing operational impact. Microsoft is optimizing the way it w ll deliver updates. A monthly update cadence aims to provide predictability, lower upgrade costs, user access to the latest product capabilities and performance improvements, and a better support experience. the ONE-V update experience available to customers and partners. You first need to Onboard: This is a one-time activity in LCS Project Settings to configure the environments for the update, configure the date and time for the production update, or select to pause updates up to three months, and to sign up for any first-release programs. We have delivered many Power BI models, reports and training sessions over the last two years, and it has been enthusiastically adopted by customers. Microsoft is continually adding new features. – Power BI Report Builder, is the latest companion application for Power BI that lets you author Paginated Reports is a free, standalone Windows Desktop application that can now be downloaded from the Power BI website. As the name suggests, paginated reports can run to many pages. They’re laid out in a fixed format and offer precise customization. Paginated reports are .rdl files. You can store and manage paginated reports in the Power BI Report Server web portal, just as you can in the SQL Server Reporting Services (SSRS) web portal. You create and edit them in Report Builder or Report Designer in SQL Server Data Tools (SSDT), then publish those to a web portal. 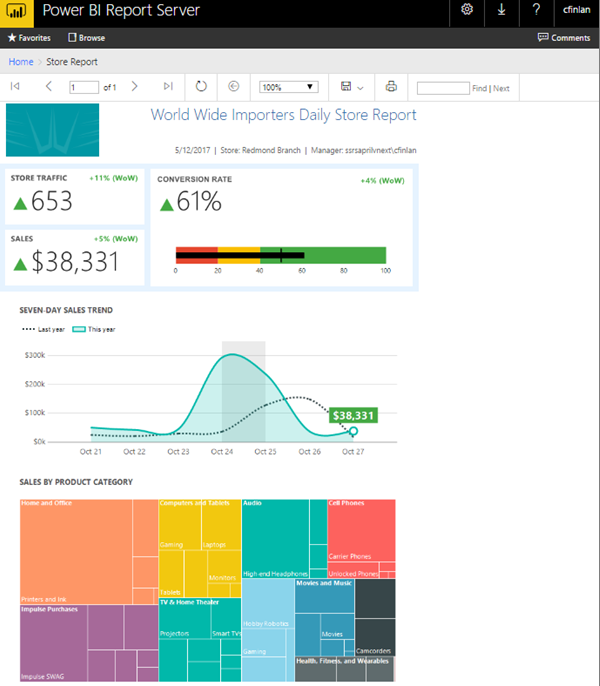 Report readers in your organization can then view the reports in a browser or in a Power BI mobile app on their mobile device. •Use the Report Builder ribbon to quickly add items your reports, launch table, chart, and map wizards, and format your report data. •Add data from built-in data providers. •Create and use report parameters and other interactive features. •Preview reports in HTML or print format. •Export reports to file formats such as Microsoft Excel or PDF. To download and install Power BI Report Builder, you can click on the COG icon in the title bar of Power BI site and select the Report Builder option. The March 2019 release of Power BI Desktop has brought us keyboard accessible visual interactions. One of Power BI’s natural strengths is that you can click on a data point within a visual and have it cross-highlight or cross-filter the other visuals on a page. Keyboard-only users weren’t able to use this feature until now. Interact with a visual using keyboard commands. Notice you can select specific data points within the line chart, and the other charts on the page filter based upon the selection. Dynamics One Version – nearly here… and then what lies ahead? Customers at User Group Summit Europe this week listened intently to guidance on updates delivered by Microsoft MVP Andre Arnaud de Calavon who explained the One Version approach. He suspects that while some customers have a good understanding, others still do not, both in terms of Microsoft’s policies and the responsibilities they will put on the customer as opposed to the partner. His message to AX and D365FO users was to prepare to own the operations of their own systems, especially as it relates to evaluating, preparing for, and deploying updates on a monthly or at least quarterly basis. • The architectural model will build on the state of the art for Microsoft today and will include the Power Platform, Azure Data Lake Storage Gen2, and other Azure service use cases thatinclude even more Microsoft products like Teams and Office 365 and Linked in features. Flow will become the workflow engine of choice over time for D365CE. A Microsoft presenter spoke against the idea of continuing with processing-intensive workflows that queue up within a relational CRM database, and slow down the cloud service. reality of this change – customers will pay for the privilege of making Flow a core component of their CRM architecture, as with Dynamics Finance and Operations for any serious volume of use, and as is the case with Power BI once you want to use it seriously. Its an Enterprise solution that comes at an Enterprise cost and it with azure it has the enterprise architecture to deliver. Because access to the production instance is controlled by Microsoft analytics for Dynamics 365 for Finance and Operations (D365FO) analytics had to use Entity Store and BYOD data sources. Expect a move to azure data lakes and the use of ADLS Gen2. The approach will replace today’s options, while putting more importance on PowerBI.com. This means customers will be required to buy seats of PowerBI.com Pro or Premium for all report consumers, plus renting their own ADLS Gen2 service. Pricing for data lakes will vary. Microsoft introduces a new class of enterprises to the use of cloud data lakes for their data optimization and reporting needs. As with the case above of Customer Engagement’s use of Flow, eliminating the expense of the Entity Store databases may not result in any comparable direct savings to offset the added expense of ADLS Gen2. Its m ore about the potential for value add of enhanced analytics. In July 2018 Microsoft announced a change to the way it ill deliver Dynamics 365 updates that will help you to stay current in a consistent, predictable, and seamless manner. With Dynamics 365 for Finance and Operations, you receive new service updates and features monthly instead of doing expensive upgrades every few years. - You can manage how your organization receives these updates. For example, you can sign up for an early release so that your organization receives updates first. -You can designate that only certain environments receive the updates. Or, you can remain on the default release schedule and receive the updates later. This topic explains the different release options and how you can use them for your organization. Service updates contain both application (including Financial reporting and Retail) and platform changes that are critical improvements to the service, including regulatory updates. New features will be included in service updates. Each new release is designed and developed by the Dynamics 365 for Finance and Operations team. Any new release is first tested and validated by the feature team, then by the entire Dynamic 365 for Finance and Operations and Retail teams. Extensive testing is done on various test topologies. A compatibility checker also runs tests to ensure backward compatibility. In addition, several customer databases and code are benchmark-tested with automation to ensure no breaks. • Ring 2 is a targeted release. This release is available to partners, customers, and ISVs who opt in through the Insider program and join the Preview Early Access Program (PEAP). During a targeted release, Microsoft monitors telemetry, collects feedback, and further validates quality by monitoring key metrics. During this phase, the release must be deployed on Dev/Test environments. In this preview phase, partners, customers, and ISVs use the release to validate their customizations and provide feedback. This release cannot be used in production. •Ring 3 is a production-ready, first release for customers who opt in. During this phase, customers have the option of taking the release all the way to production and can choose between Microsoft managing the update or self-managing the update. Participating in the First release program has the benefit of having the Microsoft engineering team closely monitoring the update for any aberrations to ensure a successful update. •Ring 4 is the final, default ring and is available to all customers. Microsoft will manage and update all environments based on the configured maintenance window. Here are some FAQs to provide clarity on the Finance and Operations service updates, processes, and tools you can use to prepare for it. Can the update to 10.0 be delayed? A customer can pause or opt-out of the 10.0 release when they are on 8.1.2 or 8.1.3. In early March, the ability to set up this configuration or to pause updates will be available through LCS. For a release date in early April, which ring is being released at that time? Is it the GA ring? Or will GA be released several weeks later? Standard release/Ring 4 production updates for a monthly release will be scheduled for the first, second, and third weeks in April. Depending on the configuration that you set up in LCS, you will receive updates during that specific week. For the April 10.0 release, Microsoft will perform updates during the weekends of April 6, April 13, or April 20 based on the configuration that you set up in LCS. Sandbox updates will always be scheduled a week before the update. The configuration setup will be available in early March. What product versions are impacted by service updates? 8.1 and later All customers on 8.1 and later will be scheduled for updates monthly with a combined application and platform update starting November 2018. You will be required to have an update that’s no older than 3 months. 8.0 Customers on 8.0 will receive a monthly platform and financial reporting update. You will be required to have an update that’s no older than 3 months. The 8.0 lifecycle ends in April 2019. Customers on 8.0were encouraged to update to 8.1 by December 1, 2018. This process is like a regular package update. For detailed documentation, see the Update environments from version 8.0 to 8.1 topic. 7.x Customers on 7.x will receive a monthly platform and financial reporting update. You will be required to have an update that’s no older than 3 months. You are required to upgrade to 8.1 before April 2019 (unless extensions are not available, the only over-layered version in market will be version 7.3). Starting April 2019, the service will be updated to version 10.0. What does the update contain? For 8.1 and later, service updates will contain both application (including financial, reporting, and Retail) and platform changes that are critical improvements to the service including regulatory updates. New experiences will be opt-in. The service updates are backward compatible. There will be a single version representing this update. What is a regulatory update? A regulatory update is a new feature or an existing feature change required by law (usually for a specific country/region). The regulatory update is always required by a specific law enforcement date (LED) and should be enabled by this date or earlier. What’s the upcoming schedule of updates? Service updates will be available each month and starttd in November 2018. Microsoft will apply the updates monthly, based on the selected maintenance window. You are required to have an update no older than 3 months. Are there any major updates post 8.1? There will be 2 major updates in April and in October where new experiences will be enabled. Major updates will not require code or data upgrade. Breaking changes will be communicated 12 months in advance such that customers can plan accordingly. Such a change will only be introduced during a major update. What does Backward compatibility mean? This covers binary and functional compatibility. Binary compatibility means that you can apply an update on any runtime environment without needing to recompile, reconfigure, or redeploy customizations. This also means that on a development environment at design time, X++ public and protected APIs and metadata are not modified or deleted. If Microsoft needs to break compatibility by removing obsolete APIs, then it will be communicated 12 months in advance and follow a deprecation schedule. Functional compatibility is about user experience, all new experiences will be opt-in. Backward compatibility does not include non-X++/metadata APIs. Microsoft reserves the right to update versions of any dependencies the product uses, as well as remove dependencies without early warning. What does end of service mean? Microsoft will not provide any fixes to issues on versions that have reached end of service. Microsoft will also not investigate or troubleshoot any issue that you may encounter on an older version. If you encounter an issue on a version that has reached end of service, you will be required to update to the latest update and report the issue if it persists. All environments will continue to be operated by Microsoft. All automatic processes around your environments, such as monitoring or self-healing, will also continue as is. Will individual hotfixes be supported? Individual hotfixes will not be supported after 8.1. Customers must update to the latest cumulative update available to apply the fix (such as 8.1.1). Critical fixes will also be cumulative and available through the LCS servicing experience. Microsoft Dynamics 365 for Finance and Operations version 10.0 includes Platform update 24. New APIs have been added to help data integration retrieve errors that occurred during the import execution runs in a data project. Telemetry, A!, Big data analytics are just some of the features that are part of the Azure cloud that are leveraged by Microsoft Dynamics. One example is the Optimisation advisor that can help business users and implementors to adopt best practices to optimize the business processes that they own. Incorrect configuration and setup of a module can adversely affect the availability of features in Finance and Operations, system performance, and the smooth operation of business processes. The quality of business data (for example, the correctness, completeness, and cleanliness of the data) also affects system performance, and an organization’s decision-making capabilities, productivity, and so on. The Optimization advisor workspace is a tool that lets power users, business analysts, functional consultants, and IT support functions identify issues in module configuration and business data. Optimization advisor suggests best practices for module configuration and identifies business data that is obsolete or incorrect. Optimization advisor periodically runs a set of best practice rules. A default set of rules is released together with Microsoft Dynamics 365 for Finance and Operations version 8.0 (April 2018). However, users can also create rules that are specific to their customizations, solutions from independent software vendors (ISVs), and business data. Optimize configuration choices to improve for example the performance of inventory closing, or wave processing, or work creation in the warehouse. To get the best out of your Dynamics 365 Finance and Operations System contact Synergy Software Systems your Dubai Dynamics Partner (since Ax v2.5 2003) – with over 200 consulting man years of experience in implementing and supporting this solution. AT the end of 2018 Microsoft announced that the. Azure Kubernetes Service has added the open-source system, Moby, to provision containers and deliver more frequent upstream patches. Additionally, the team reduced cluster provisioning time, fixed a Stream Watcher error and updated a Linux kernel for a second GitHub problem. Azure Monitor Logs UX was in preview last year, users can now click on charts and tables in Log Analytics in view the new Logs UX instead, with a new query editor and full schema view. On January 2, Qatar’s prime minister, H.E. Skeikh Abdullah bin Nasser bin Khalifa Al-Thani opted to help setup a large Azure data center. The prime minister and the Cabinet issued a draft law creating a “Media City” with an independent budget that will host the data center. Microsoft already operates a Content Delivery Network (CDN) in the country, but it has no cloud regions active in the Middle East. That is about to change, though – last year, the company announced that it would open data centers in Dubai and Abu Dhabi in 2019. Ankabut, the United Arab Emirates’ Advanced National Research and Education Network (NREN) an initiative of Khalifa University, offers academic institutions connectivity to other education networks around the world. It has partnered with Huawei, to launch a cutting-edge new cloud solution in the UAE, Microsoft’s Azure Stack. This will be the first implementation of Microsoft’s Azure Stack solution in GCC and the ME Region. Through this partnership, Ankabut aims to take the education infrastructure in the UAE to the next level of innovation and intelligibility by implementing the platform that will offer educational institutes cloud-paced innovation and computing management simplicity, cost optimization, higher quality, huge potentials and capabilities, in addition to more reliability and added value services. This release is compatible with Dynamics 365 9.x. Weekly time entry with support for customizations. This feature enhances the time entry experience in Project Service Automation by providing the ability for project resources to enter time for the entire week at the same time. It will also be possible for system customizers to customize this view with custom fields or lookups to other entities. Customizers will also be able to implement custom business rules to support their organization’s practices. With this feature, users of PSA price list will be able to create new price list from an existing price list and apply inflationary markups on the different components of the project price list. With this feature, certain expense categories can be setup with appropriate units and a price and cost per unit using price lists in PSA. This setup will be used to default the per unit rates on all business transactions in PSA such as Quote line details, Contract line details, Project estimates, Expense entries, Journal lines and Invoice line details. This feature opens up scenarios around pricing and costing Mileage, out-sourced work and some unit – based work categories such as processing pay slips, invoices etc. on projects. With this feature, both product-based contract lines and the time and expense actuals have to be marked as “Ready to invoice” before these can be added to a draft invoice in PSA. This feature allows for customizations in the area of PSA’s proforma or invoice proposals. Customers and partners have a way to tailor the creation of draft invoice proposals in PSA by programmatically manipulating the Billing status values on unbilled sales actuals for time, expense, fees and on product-based contract lines. ◦ • Allow user to delete products lines from Project Invoice when the invoice in the draft state. ◦ ◦Full screen toggle- This new UI control enables users to expand the following grid to full screen for an improved editing experience: Schedule, Resource Assignments, Resource Reconciliation, Estimates and Expense Estimates. •Fixed: Restricting the ability to create invoices without approved actuals. •Fixed: Deleting a contract milestone for an unposted invoice, prevents posting or deleting of the invoice. •Fixed: Tracking View: Client-side and Server-side calculations are different. •Fixed: Invalid invoice frequency setup can lead to “Object reference not set to an instance of an object” error when trying to create an invoice schedule. •Fixed: Project Approval has overlapping command sequence for “Approve” and “Reject” impacting the Ribbon Work Bench. •Fixed: Null reference exception when creating Project Team Member (and booking resource) through Workflow. •Fixed: Marking a resource request as complete removes the generic resource from the assigned task when multiple named resources fulfilled the requirement. •Fixed: Solution Upgrade failures when customer data contains tasks with null dates. This version will be released in January 2019 and has an actual build number of 8.1.227. It includes platform update 23. Set up collection letters by customer,, so that the collection letter code for each transaction is tracked, but the collection letter processing is based on a single collection letter level that is stored for the customer. To settle the amount remaining from settlement activity by applying that amount to a ledger account or to another customer. Settle the remainder either when you are settling amounts entered into a journal, or when settling open transactions. •	Import from files in JSON format. You can now configure an Electronic reporting (ER) format to parse incoming files in JSON format. You can then set up ER mappings that specify how information from JSON files is used to update application data. •	Support country context-specific ER model mappings. To isolate country-specific logic of data access in a single ER model mapping. o	Specify a country context for ER model mapping. o	Manage multiple country-specific mappings for a single ER data model. o	Depending on the legal entity’s primary address, the appropriate country/region-specific model mapping will be used when an ER format is used to generate an electronic document. There are also some Russian localisations for AR AP movement registers that may be worth checking. For grids with cross-company queries, users can filter the Legal entity column using the column drop-down menu, similar to other columns in the grid. A user looking at the global transactions for a specific customer, can find the transactions within a small subset of companies. Prior to this feature, he would have had to filter using the Customer range tab on the Advanced filter or sort dialog box, or utilize page-specific custom filters. In Platform update 22, the Export to Excel feature was improved to allow users to export up to 1 million rows from a grid in Finance and Operations, a substantial increase from the previous 10,000-row limit. In Platform update 23, after the export completes, users will receive a notification in the Action center that the export has finished. The notification includes a link to download the Excel file containing the exported data. The link and notification are accessible for approximately three days after the export completes. System network printers management form. System Administrators can use this, along with the Document Routing Agent (DRA) to register network printers with Dynamics 365 for Finance and Operations. When you enable this feature, a Preview link will appear on the System network printers form (Organization administration > Setup > Network printers and click System network printers). After you register the network printers with the service using the DRA, you will see the configuration information for each legal entity in the organization. Microsoft Dynamics AX 2009 and earlier versions supported INDEX HINTS from X++. However, this was deprecated when Dynamics AX 2012 was released. A reason why this was deprecated is because a misguided index hit could damage the queries. However, thousands of queries in hundreds of tenants shows that SQL may come up with less optimal plans for simple queries, Finance and Operations has thus brought back X++ hints. However, X++ hints should still only be used with extreme caution. Use Index hints sparingly, and only when you can ensure that it causes more benefit than harm. When in doubt, avoid using index hints. A new API is added on common allowIndexHint with a default behavior of False. This allows developers to opt-in and explicitly enable index hint. The old syntax on the select statement for specifying index hint is reused.For an existing X++ code that specifies index hint, there is no change to the current behavior until the new API is invoked. Let the system manage Entity store refresh instead of scheduling the refresh yourself. When enabled, choose a refresh pattern (hourly, twice a day, daily, or weekly). When specified, the system keeps the entity store updated for the selected pattern. The system will also switch to the new update form, where you will be notified with a status and possible refresh issues. In Platform update 23, you can select to use Entity store as a Data Lake. When this feature is turned on, Entity store data isn’t populated in the relational Entity store database in the Microsoft subscription. Instead, it’s populated in an Azure Data Lake Storage Gen2 account in your own subscription. You can use the full capabilities of PowerBI.com and other Azure tools to work with Entity store. For more information: contact Synergy Software Systems, Dubai based since 1991 and Dynamics Partner since 2003. This update was released in December 2018. • Improved Sitemap: Improved the Field Service app module sitemap including Connected Field Service entities. • Field Service SLA: Implemented SLA for Work Orders which connects the long-standing SLA functionality to the Work Order Time From Promised and Time To Promised fields ensuring that arrival time related SLA fulfillment is driven by existing Field Service scheduling tools. Note: Out of the box, SLA is not enabled on the Work Order entity. Enable it to use the two SLA KPIs that are shipped as part of the solution. Connected Field Service (CFS) and the IoT solution, now deploys with Field Service. The CFS solution extends Field Service to cater to IoT device-driven scenarios so that organizations can respond to device anomalies and react. This allows customers to predict issues in advance and fix issues remotely or schedule a service visit, preventing failures in a proactive way. • The CFS solution is now available out of the box with Field Services, which eliminates the need to separately install the additional solution package. • The sitemap for the Field Service app module now includes the CFS entities as part of the default navigation. The IoT settings in the navigation are now merged with the settings section of Field Services. Note: Non-System Administrators may need to include additional permissions for the CFS entities to see the CFS entities. • The CFS deployment app for PaaS customers (with Azure IoT Hub) is re-architected for improved performance during initial setup. The user experience for deployment process is also updated to provide better deployment experience for administrators. • New Field Service Mobile app: The new mobile application that brings with it a plethora of new features. See https://aka.ms/fsmobile-docs for more information. • Push Notifications: Send push notifications to the new Field Service Mobile application based on any conditions. Create a workflow and select the Field Service Mobile Entity Push Notification workflow action to use this feature. • The out-of-the-box example workflow will allow bookable resources to be notified when they are booked on a work order. • Geofencing: Enable geofencing so that when a booking is scheduled for a work order, a geofence gets created around the service account for that work order and any exit or entry of that geofence by a bookable resource can generate a geofence event record. Out-of-the-box workflows are provided that can perform actions based on these geofence events such as sending a push notification to a bookable resource’s Field Service Mobile app when that resource arrives on-site for a work order. Dynamics 365 Finance and Operations – One Version upgrade – are you ready? That is getting very close if you are sitting on a legacy v7 or 7.3 version. There is an additional challenge if you have customised code or an ISV add on that still uses layered code then that will need to be rewritten using extensions. For cloud deployments Microsoft does most of the heavy lifting for you. However, it might not be that simple especially for DEV?BUILD and TEST evnironments. When the environment has other non-Microsoft packages installed, LCS will prevent you from simply applying the update package. You may have some ISV-solutions or some package you’ve created and released, and then installed on the environment, through LCS. When you try apply the update package, LCS will stop you, and list the non-Microsoft packages installed. packages blocking you. So there is rather more work to do. You may also need to consider expiring certificates. Dynamics 365 for Finance and Operations version 8.1 is the latest major release before Microsoft will move over to the “OneVersion” strategy. From April 2019 onwards all D365FO customers will be migrated to the latest version (v10 release is planned for april 2019), and will kept updated to the latest version thereafter. It is therefore very important to upgrade to the 8.1 release for all customers running an older version of D365FO. An important reason is that Microsoft has guaranteed that the move to 10 will be only supported form version 8.1 So make sure that you are on this version before April 2019. There is limited time and skilled resource available, so if you have not already put plans in place then don’t delay. For expert assistance to upgrade your Ax7/D365 environment call us on 00907143365589. Microsoft Dynamics 365 and Microsoft CRM users wigh cloud and/or browser-based access to Dynamics must upgrade to Microsoft Dynamics365 / CRM Version9 (V9) by January 31, 2019 or may face potential security and work-impacting issues. If you did not self-schedule this update by last August, Microsoft will force an upgrade for anyone on Microsoft Dynamics Version 8.2 or earlier. As of February 1, 2019, Microsoft will no longer support any of their customers that did not complete the upgrade to the newest version. The size, cost, and scope of upgrading your Microsoft Dynamics environment to the supported version depends on the complexity of the customizations. Microsoft does not require third-party add-ons to continue to support the add-on in the future, meaning third-party apps in your account may not be compatible with the January 2019 upgrade. Custom development that was applied to your Microsoft Dynamics instance should be checked for compatibility with the upgrade in a separate environment. Some and maybe all of your customizations may have to be re-implemented in your environment to comply with the upgrade. Time to analyse develop, test, deploy etc is running out. On-premise Microsoft 365 users are not currently up against a deadline for upgrade–but it is certainly a possibility in the future.